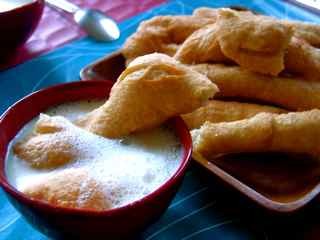 But, in contrast to Spanish churros, which are more of an afternoon snack, Youtiao is a popular Chinese breakfast. In English, probably it can be described as “oil fried strip’ (‘You’ means oil, tiao means things in strip shape) – just like churros. ‘You tiao’ are very popular across different regions in China, of course, different regions have different way of serving them, for example, in North, we have them with soy milk, where other places, it can be wrapped in an other thin ‘pancake’, or stuffed with sausage. My lovely doesn’t trust the oil used for frying You Tiao sold in the stalls, so if we want to have it, he would still make it at home. But when I was little, my dad would make it on almost every Sunday morning. Hearing my dad cooking You tiao in the kitchen was one of my most relaxed memories of my childhood ‘holidays’. 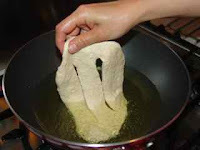 Youtiao are not difficult to make — raise up the flour, make it into shapes, then fry it in the oil. However, to make it nice is not so easy. 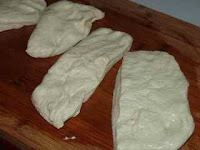 (At least to me, I started to learn making it at home after the increasing ‘foodsick’’, but failed many times). 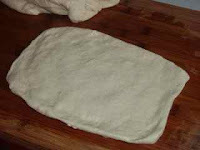 Different kinds of raising agents can be used for raising the flour dough, the trick is that you need to make it less ‘solid’ as you would make … for example, bread, but still good enough to hold up as a whole. 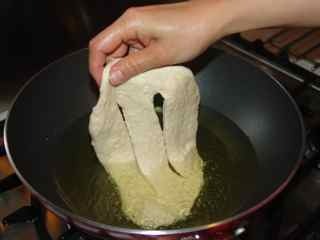 The most important part for making ‘Youtiao’ is, after frying, the flour dough would raise up, having ‘bubbles’ in the middle, so the ‘Youtiao’ is very soft. 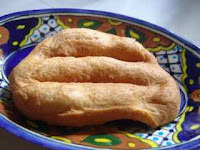 Well, saying that, there is another type ‘youtiao’ is crispy, which is also good, but the flour dough needs to be very thin. And for the shape, if you buy from the restaurants or the ‘Youtiao’ stall, they normally are in ‘stick’ shape, but homemade is normally as a ‘fried flat bread’ with some cuts in the middle — easy for separating it when eating. I normally use the proportion as 4 cups of flour, 1 and half cup of water, and 2 tablespoon of oil, 1/2 tablespoon of salt, around 5g of fast yeast. 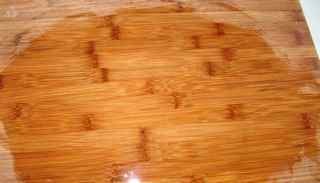 1) Brush the board with oil, and place raised flour dough on top of it. 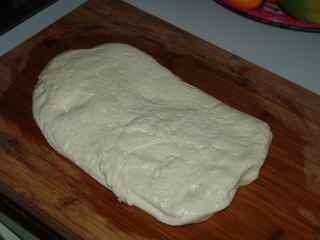 2) Press the dough down to flat (around 1cm thick, for example), and divide the big dough into smaller portions. 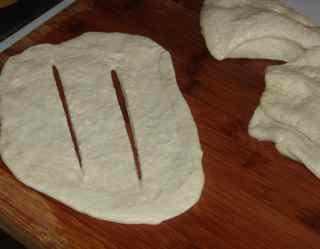 4) Use a knife to make couple of ‘cuts’ in the middle of the ‘flat sheet’. 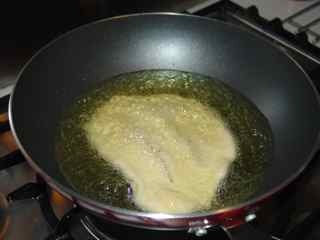 5) In a wok, pour in oil (quite deep). 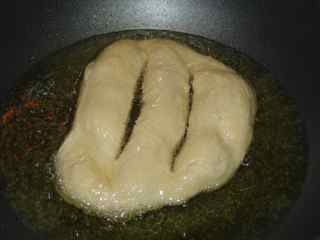 When the oil is very very HOT, (if it is not hot enough, the dough would not raise up with bubbles, instead will be ‘solid’), place the ‘flat sheet’ in the oil. 6) Keep on turning over, make sure both sides are ‘raising up’. 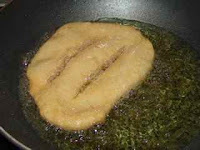 7) Then remove it to the plate. In northeast China, we normally have it with either rice congee or more popular with soy mike (to soak ‘Youtiao’ in the soy milk).